Brand: The Cocktail Box Co.
View More In Bar Sets - Page 2. One of our favorite things to do is buy a round a drinks for our friends. What used to be beers has become cocktails as we've matured but the love for shared conversation over beverages will never die. Our goal was to create a bar-quality cocktail experience that you could take anywhere or give to someone. Who doesn't like great cocktails? This seemed like a worthy cause. The first step was to create the perfect recipe for our cocktails. So we tasted. And tasted. Then we took a nap. Then we tasted some more. Bitters. It's all about the bitters. The bitters are the botanical extracts you add to make cocktails. We tried hundreds of recipes. Until we got it just right. We've added three bitters variants to the kit. You can actually make many variations of the Old Fashioned cocktail with these bitters we've included. After making 1000's of cocktails we've come to realize that the spoon and muddler are very important. So we custom-designed a stainless steel micro spoon that can also muddle like a boss. It's double-ended - wowza! The next step was to fit everything in a well-designed 'kit' so you didn't feel like you were giving someone a big bulky item. We knew most people would give this product as a gift so we kept that in mind throughout the entire design process. The kit fits right in your pocket. It's quite remarkable. Three bottles of bitters, cocktail picks, the spoon, the sugar, the linen napkin all fit seamlessly inside of these handheld boxes. Our Handcrafted Cocktail Kits make the perfect gift in any occasion or celebration! It's not just a gift, it's an experience! 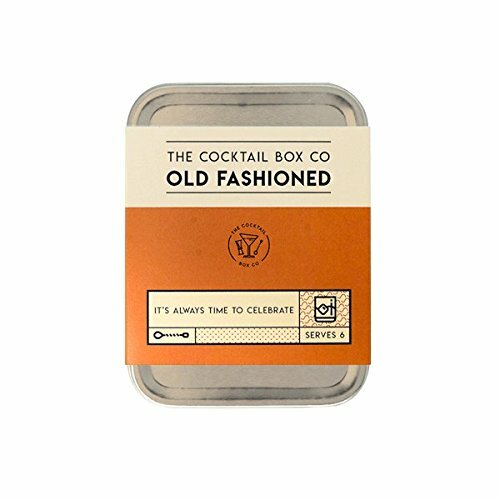 Each cocktail kit provides the premium ingredients needed to prepare 6 perfectly tasting (and Instagrammable) Old Fashioned cocktails. Every piece of the kit has been customized and refined. When you open the kit you immediately sense the craftsmanship and quality, setting the stage for a high-quality beverage experience. Surprise and delight your clients, your friends or the guests at your event. Make it a memorable occasion with these posh-looking cocktail kits. Stop with the boring wine bottles, give a gift that beverage lovers will remember you by. If you have any questions about this product by The Cocktail Box Co., contact us by completing and submitting the form below. If you are looking for a specif part number, please include it with your message.